There are a few online casinos that literally exude elegance. Our Miami Club Casino Review will show you all the ways this casino is all about magnificent gaming in an elegant atmosphere. They start with WGS Technology software which has become famous for brilliance. Then they boost your play time with great bonus codes. And then…. it just continues to get better! Brave Miami Club Player Wins a Whopping $45,000! One brave Texan recently turned his afternoon entertainment into $45,000! Check out the Ultimate 10x slot game and see how you too can rake in a great win! Fall on the 10x Wild button, then go for the Gamble for a 50-50 chance of DOUBLING your win! While there, new players can take advantage of a 200% Match Bonus and Free Spins! All players will get another 25 Free Spins on the City of Gold slot – use the bonus code MAYDCY – available until May 31! Miami Club Casino evokes the elegance of the Miami scene in the early years when the warm South Florida winters had just been discovered by frozen northerners. The casino reaches out to high rollers—who know full well what it’s like to play for real money—from the very first but is also a great place for the more modest gamers to play. The greatness of this casino begins with WGS games. There are as yet only a handful of online casinos that feature games from this developer. WGS has earned the reputation for being one of the finest, classiest game developers working the online casino market. You can play in download or instant play modes. The great visuals and sound provided by WGS make Miami Club a phenomenal place to play in instant mode. By doing so, you save your hard drive for other important content such as work-related files and docs, movies, music, and (being realistic) other games! 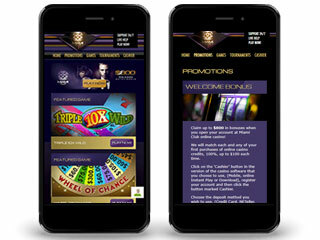 The casino also supports almost all mobile devices so you can carry the casino with you wherever you go! Here, again, the excellence of the WGS graphics plays a big part in making mobile gaming perhaps even more popular at this point than desktop gaming. The casino is audited regularly by an independent industry watchdog. These audits test the Random Number Generator (RNG) for accuracy and fairness, casino banking methods for both deposits and withdrawals, and payout rates. Because the RNG controls every outcome of every bet, the payout rates can fluctuate but, over time, the rate for Miami Club hovers around 97%. As you read on in the Miami Club Casino Review, you’ll learn about the exceptional tournaments, awards promotion, VIP extras, and much more. Miami Club runs over 150 games from WGS. The gameplay in WGS games is exceptionally smooth. The games feature the most creative graphics but it is the sound and special effects woven into the game tapestry that set this developer apart from all the others. They have a huge selection of slots with the usual complement of nostalgic three reel and fruit slots, moving on to the much more modern five reel slots but, not content with mere modernity, the casino continues on to a selection of hyper-modern seven reel slots! The casino has a sizable library of table games. These are the well-known choices such as blackjack, roulette, craps, and poker. The graphics give the table games an aura unique in online casinos. Players who love poker often find their way to video poker. 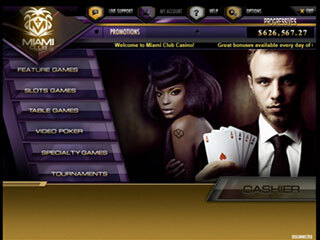 Miami Club has much more than a few great video poker offerings with the usual wonderful elegance in game play and interface for which WGS is famous. Video poker lovers can play from a single game at one time to as many as 100 games simultaneously. If you know the games well, and are adept at making the right hold or discard choices, the availability of playing 100 games at one time may mean sizable wins over the course of a playing session. The casino runs 11 progressive jackpots in slots and blackjack. The top jackpots are usually in the high six-figure range but can occasionally enter millionaire territory. Miami Club features many promotions in addition to the amazing welcome package of bonuses. Those bonuses are literally just the tip of the iceberg when it comes to warm water bonus codes at Miami Club. You can avail yourself of a special deposit bonus code every day of the week. The play- through requirements for these bonuses are generally only 25x, one of the fairest such requirements at any online casino. The casino holds a huge number of slots, video poker, and blackjack tournaments. Of course, this casino is far from the only one to hold tournaments. Theirs are considered among the best online because of their wide range and because of the WGS game software. Buy-ins are often free and the highest buy-in is a mere $5. Every player is automatically enrolled in the comp points program from their first bet onward. Comp points are determined by two important factors. First is the size of your bet; the higher the bet, the larger the conversion into comp points. Second, your status in the comp points program also determines the number of points you receive for any wager. In keeping with this idea, the casino has named the comp points program the Miami Club. They consider every player to be a potential VIP. The club has six status levels named after streets or districts in Miami. The first level is Flamingo and the highest is Millionaire’s Row. As we’ve stated a couple of times already, Miami Club features WGS Technology. Every online casino is duly dedicated to the safety of your money as it flows to and from the casino in cyberspace and, of course, when your money is held on account at the casino. Miami Club employs the finest SSL encryption software to protect your money at all times. The two outstanding qualities of the customer service team at Miami Club are that they’re open 24/7/365 and they serve a multi-lingual clientele. You can reach a professional service representative any time by way of chat, email, or toll-free telephone. Whether you were looking for a great VIP casino, or simply an online casino with fantastic games and visual elegance, we trust this Miami Club Casino Review has steered you in the right direction. Try out the casino now and play in free play mode for as long as you wish. 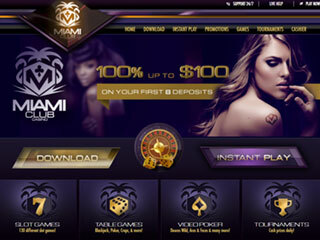 The free play experience will likely convince you to set your online gaming hat at Miami Club Casino.